Inside this week: ice cream sandwiches, chips and burgers. This week saw 60 fish & chip shops named as the nation’s best in the National Fish & Chip Awards. London managed only two entries in the list: well-known Spitalfields favourite Poppies, and Toff’s of Muswell Hill. In other chippy-related news, London’s oldest fish & chip shop has announced expansion plans. The owners of Covent Garden’s pun-tastic Rock and Sole Plaice, which opened in 1871, will launch Rock and Sole Plaice Kitchen and takeaway-only RSP Express in the capital later this year. The former is likely to be in Soho, while the latter is thought to be within a train station. London’s had a fair few niche food pop-ups, but the latest one from bakers Gail’s really takes the biscuit. 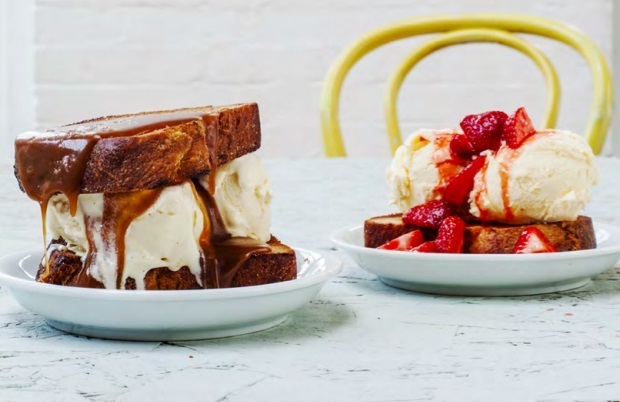 From 20-30 August, its Wardour Street branch will take on a new guise as a pop-up ice cream sandwich bar. Tuck into the likes of vanilla ice cream encased in cinnamon brioche toast and drizzled with chocolate fudge sauce, or pistachio ice cream and sour cherry compote sandwiched between chocolate chip cookies. It’s open from 7-10pm on Wednesday-Saturday evenings — catch it before it melts away. Tickets are on sale now for a charity event dedicated to creating the capital’s best burger. Eco-chef Tom Hunt has teamed up with Action Against Hunger to rally chefs and foodies to create a ‘Five Star Burger’. Hawksmoor chef Richard Turner, Ceviche owner Martin Morales, Burger Mondays founder Daniel Young and the Forza Win team will collaborate to create the super-burger, which is to feature a bone marrow patty and lacto-fermented pickles. Tickets to the event on Wednesday 10 September cost £20 and include a cocktail plus live music. All proceeds go to Action Against Hunger. Greenwich brewery Meantime has launched a pop-up bar in Peninsula Square, outside The O2. Made out of shipping containers, BeerBox offers most of Meantime’s range, including the exclusive Peninsula Pale Ale which is served direct from the tank. It’s set just a mile from Meantime’s brewery. The second branch of The Butcher’s Hook gastropub opened in Ravenscourt Park this week, following the Fulham Road original. Next week will see a new branch of Tom’s Kitchen open in St Katharine Docks, it will be the fourth in Tom Aikens's mini-chain with others in Chelsea, Canary Wharf and at Somerset House. It has also been announced that a second branch of Vietnamese banh mi restaurant Keu will launch in September, bringing the successful Shoreditch concept to Soho.